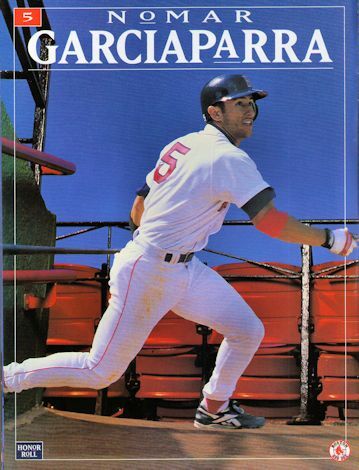 ON THIS DATE (September 2, 1998) ... Red Sox shortstop Nomar Garciaparra hit a ninth-inning, game-winning grand slam tonight in Fenway Park against the Mariners. And in the aftermath of a 7-3 win that was the Sox' 16th victory in their last at-bat, many voices joined as one in an ode to joy that resonated on Yawkey Way with a singular chord: "M-V-P, M-V-P, M-V-P."
Nomar's home run, whose launch came off reliever Bobby Ayala and whose touchdown came in the left-field screen, was his first big league grand slam and also resonated with history. It was his 30th home run of 1998, making him just the fifth player to hit 30 or more in each of his first two seasons. Mike Benjamin started the winning rally in the ninth when his chopper over the bag fell out of third baseman Russ Davis's glove. Originally, it was scored an error but was changed to a hit by official scorer Charles Scoggins. Considering Davis already had 34 errors, maybe Scoggins didn't want to be accused of piling on. Ayala then walked Darren Lewis on four pitches, Darren Bragg sacrificed the runners over, and Mo Vaughn was given an intentional pass, setting the stage for Nomar. Two pitches later, it was over. The last swing of the night marked the second time this season Nomar has ended a game with a home run.